Why an A1K9 Personal Protection Dog? Many of our clients have already invested significant amounts of money in alarm systems and other measures in the hope that it will preserve the security of both their homes and families. Many of these people prior to buying one of our trained protection dogs, had already become victims of burglary and/or violence, either related to a home invasion or simply because they were in the wrong place at the wrong time. Burglar alarms or other home security measures, if not bypassed, will offer some warning and possibly some protection against imminent attacks on the home. Unfortunately, it is becoming all too common to read of situations where thieves have managed to circumvent the in-house security and once that happens the occupants are often left at the mercy of the robbers! A number of our clients have sustained injury and others have had members of their families threatened by thieves in order that the robbers could gain access to safes, cars and other items that only the householder could provide access to. Our trained personal protection dogs have on numerous occasions proved to be the answer to dissuading would be burglars or attackers. We have also been told about a number of occasions, people have been allowed to enter houses masquerading as trade’s people, their true reason for calling not becoming apparent until they had affected entry to the property. This is when one of our protection dogs really comes into its own as they are ever vigilant and will quickly react as the mood of a situation changes. Burglars Are Likely To Think Twice Before Tangling With One Of Our Trained Dogs. Our trained personal protection dogs have on numerous occasions proved to be the answer to dissuading would be burglars or attackers. They are not easy to bypass, they have no security codes or swipe cards, and they do not require electricity to function. These dogs are naturally very loyal and protective of the families who purchase them, look after and love them. It is well documented that criminals try wherever possible not to tangle with dogs, even untrained ones and the larger the dog, the greater the deterrent. Whilst we mainly train and supply German Shepherd dogs, we will occasionally have other guarding breeds available at our facilities e.g. 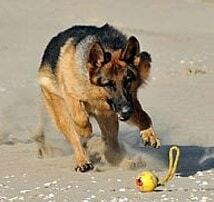 Dobermanns, Malinois, Giant Schnauzers and Dutch Herders trained as family protection dogs. These highly trained family and personal protection dogs are not merely guard dogs and unlike alarms, they will not solely work within the confines of the house. They are highly trained bodyguards with fur and will protect their owners and families from attack in any eventuality. 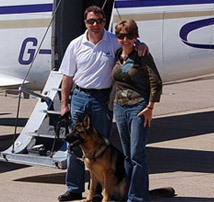 A large number of our executive level dogs accompany their families on holidays and business trips and will perform the duties that might otherwise be the job of a close protection operative. Our protection dogs are able to defend at a moment's notice but still retain all the other qualities of a loving, sociable family companion. 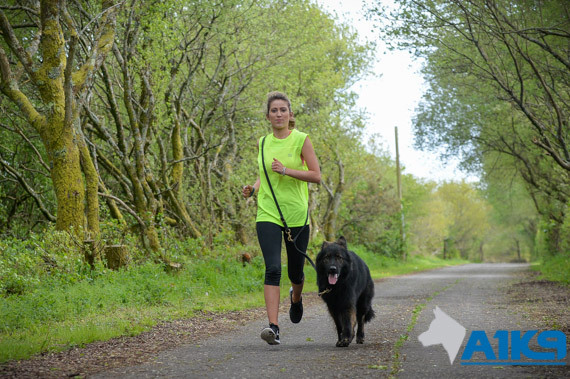 There are many geographic areas where there are quite high numbers of A1K9 personal protection dogs and it would not be uncommon to see these dogs going for a jog early morning with their owners or equally going with them on the school run. Our personal and family protection dogs often double as jogging partners, enjoying the exercise, while allowing their owners to safely run in more remote locations. At A1K9, we harness the natural abilities of the dogs that we select and through training, provide our protection dogs with the additional skills to effectively defend our clients when called upon. Not All Protection Dog Companies Are The Same As A1K9, Some Lack Experience, Some Have No Morals, Whilst Others Really Do Not Have A Scooby Doo What They Are Doing! Over the last few years, there has been a huge increase in other companies purporting to sell trained personal protection dogs - and if one was to read and believe all the claims made on the internet, it would be easy to be lulled into the false sense of security that all protection dogs and protection dog companies work to and achieve the same results. They don't. Our history can be verified - we have a proven track record for supplying these dogs over two decades and our business has a proven and credible heritage. We would strongly encourage any prospective purchaser, to fully satisfy themselves that the company that they choose to provide a dog that is to live with and care for their family, can live up to the claims that many people make on their sometimes wildly exaggerated websites. Make sure the company has a valid VAT number and verify their existence with Companies House, as one might expect any company providing more than a few personal protection dogs each year should be VAT registered. One should possibly treat companies only advertising a mobile telephone number and with no address details on their site with a degree of scepticism. With A1K9 you can not only be assured of a quality protection dog that is professionally trained and conditioned, has been vet checked and will be suitable to live with your family, but you can further rely on the fact that our on-going customer service and support is second to none and we are happy to stand by any claims we make in relation to our dogs and business practices. The Risk That You May Run From Dealing With The Lowest Bidder Is That The 'Trained' Dog That You Buy May End Up Being Detrimental and/ or Dangerous To The Family That It Was Bought To Protect. "It's unwise to pay too much, but it's worse to pay too little. When you pay too much, you lose a little money - that's all. When you pay too little, you sometimes lose everything, because the thing you bought was incapable of doing the thing it was bought to do. The risk that you may run from dealing with the lowest bidder or an individual lacking in experience is that the 'trained' dog that you buy, may end up being detrimental and/or dangerous to the family that it was bought to protect. Guarantees made by individuals and /or companies that have no substance are worthless!" 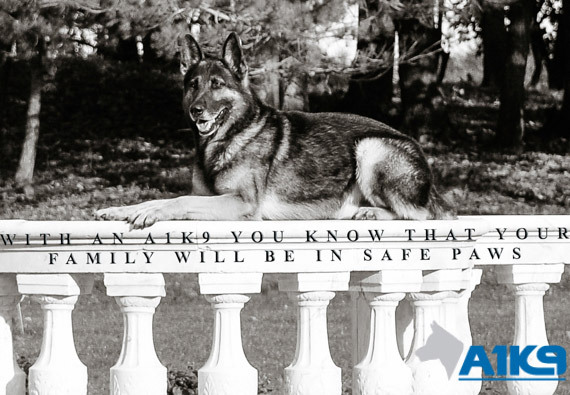 Personal and family security is less of a concern when you own an A1K9 personal protection dog, as you have peace of mind in the knowledge that criminals are likely to go elsewhere.